Taree trainer Wayne Wilkes is confident that his in-form gelding Sniponet can overcome a horror draw and notch up a hat-trick of wins in Friday’s $35,000 Cessnock Leagues Club Jungle Juice Cup (1350m). The famous Jungle Juice Cup is in its 37th year and has attracted a capacity field of 14-plus an emergency. Sniponet lumped 61kgs and overcame an outside barrier to finish strongly for a narrow win at Tuncurry on September 7. 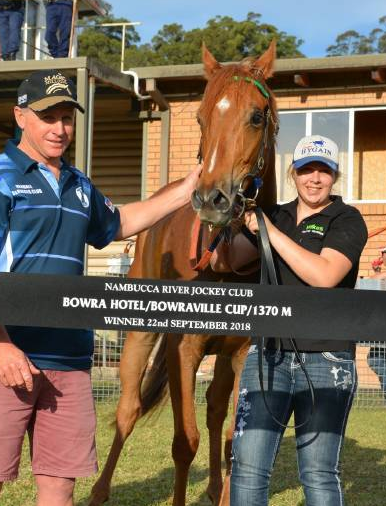 Last start on September 22, the five-year-old raced away in the straight to win the Bowraville Cup. Andrew Gibbons has ridden Sniponet in his past four starts and the Novocastrian has the mount on Friday. Gibbons is currently in fourth place in the 2018/19 Australian Jockeys Premiership with 32 winners in the first 2½ months of the season, rode Booboo to win the 2007 Jungle Juice Cup. Wilkes will saddle up his first Jungle Juice Cup runner. “Sniponet is in very good form and if he has any luck from this draw I believe he can win. I expect my horse to go forward and he has good gate speed. Hopefully, Gibbo can slot in and the horse gets a good trail. "The prospect of a wet track does not bother me as Sniponet loves it soft with three of his four wins on wet tracks. He is a family favourite and why not. He has had 19 starts for me and he has won more than $90,000 with four wins and 11 placings. "My other runner, Lucciola Belle in the last race, also has drawn wide but she will be hard to beat with any luck,” Wilkes said on Wednesday. Robert Thompson who has ridden a record 11 Jungle Juice Cup winners and Jeremy Sylvester who has prepared eight winners of the race, will combine with Gronky in the 2018 event. Bjorn Baker’s filly Lucky Siren should break through for her first win in the 1150 metre Fillies and Mares Maiden Plate. The three-year-old has been placed in her only two starts at Scone and Muswellbrook. Lucky Siren has a wide barrier, but she has genuine speed from the barriers and this is a winnable race for the daughter of Choisir, who has been placed on a soft track. Former Queensland gelding Real Classic has been responsible for two eye-catching performances in the Hunter Valley recently and he has bright prospects in the 1150 metre Class 1 Handicap. Scone trainer Stephen Jones prepares Real Classic these days and the five-year-old will have a nice sit behind the leaders from barrier one. He has finished fast when runner-up at Scone and Muswellbrook recently. The speedy Rouge Runner is set to make it back-to-back Cessnock victories when he contests the 900m Class 3 Handicap. The lightly-raced Rouge Runner ran down the leaders to win running away on September 17. On September 28 he was an easy winner of a Gosford trial. Jason Deamer’s promising three-year-old Time Raid can atone for a narrow defeat when a short-priced favourite at Newcastle last start when he steps out in the final event a 1570 metre Benchmark 58 Handicap. On a soft track on September 7 at Tuncurry he outclassed his rivals to win by more than four lengths. The gelding was grabbed near the post at Newcastle on September 29.